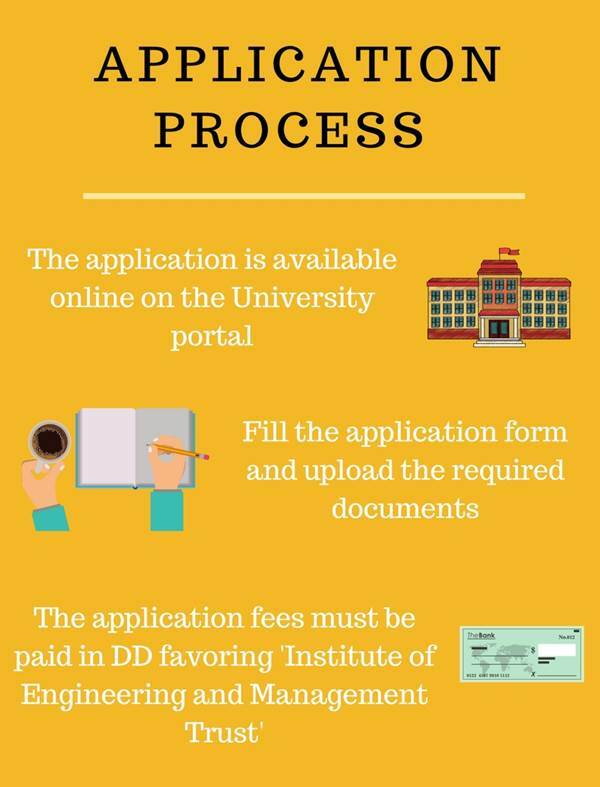 The application form is available on the official website of Institute of Engineering and Management, Kolkata. Attach the required documents along with the application online and submit the application form. The application fees should be paid by DD in favor of 'Institute of Engineering & Management Trust' at Kolkata. The admission process for Institute of Engineering and Management, Kolkata will be based on West Bengal Joint Entrance Examination (WBJEE) or Joint Entrance Examination Main (JEE-Main). After the entrance examination, there will a Group Discussion, Personal Interview, and Counselling. The admission process for the degree will be based on Common Admission Test (CAT) or Management Aptitude Test (MAT) or West Bengal Joint Entrance Examination (WBJEE). The admission process for Institute of Engineering and Management, Kolkata for the degree will be based on Common Admission Test (CAT) or Management Aptitude Test (MAT) or West Bengal Joint Entrance Examination (WBJEE). The admission process is based on the University Entrance Examination and followed by a Counseling Process. The candidate should have passed 10+2 examination and should have studied Science and Mathematics as mandatory subjects with 50% aggregate from a recognized Board of education for Institute of Engineering and Management, Kolkata admissions 2019. 60% aggregate marks at 10+2 level. Must be of West Bengal domicile. Must have WBJEE / JEE Main rank. Those who apply must have passed in Bachelor's degree in any stream with minimum 50% aggregate from a recognized College/ University. They should have a valid Common Admission Test (CAT) score for admission to IEM. Bachelor's degree from a recognized University in any stream. The candidate must have passed 10+2 examination and should have studied Business Maths and Commerce as mandatory subjects with 60% aggregate from a recognized board of education for admission to Institute of Engineering and Management, Kolkata. The candidate must have passed 10+2 examination and should have studied Mathematics as mandatory subjects with 60% aggregate from a recognized board of education for admission to Institute of Engineering and Management, Kolkata. The candidate should have passed 10+2 examination with English and Mathematics/ Computer Science/ Computer Application as a mandatory subject. The candidate must have passed in Bachelor's degree in relevant stream from a recognized College/ University for admission to Institute of Engineering and Management, Kolkata. The candidate must have passed in Bachelor's degree in BE/ B.Tech in the relevant stream from a recognized College/ University. Minimum requirement is to have passed Bachelor's degree in any stream with minimum 50% aggregate from a recognized College/ University for admission to Institute of Engineering and Management, Kolkata. Eligibility criteria for getting admission in Institute of Engineering and Management is having a good rank in WBJEE especially for electronics stream. I took the WBJEE exam for getting admission in this college. The cut-off for this stream would be around 2500 rank in WBJEE exam. The eligibility criteria is we have to get atleast 70% average marks in +12 level exam... This college takes there student through west bengal joint interance examination or JEE MAIN. For WBJEE you have to rank above 4500 for your admission .. and JEE MAIN you have to rank above 60000. Some management quota is also available here. The eligibility criteria for Institute of Engineering and Management is that you need to give WBJEE to get admisssion in this college.Your rank should be apporximately under 2500 for getting CSE branch,under 3000 for ECE and 3500 for IT. For electrical and mechanical under 5000 will work. Eligibility criteria for joining Institute of Engineering and Management, [IEM] Kolkata is passing the intermediate (appearing or passed) with physics, chemistry and mathematics. WB JEE is the entrance exam with the cutoff of 120-130 out of 200 overall to get admission. For the B.Tech course admissions are done from WBJEE and JEE MAIN entrance examination. Majority of the seats are filled up using WBJEE. One needs to have a rank under 4000 to be selected at Institute of Engineering and Management, [IEM] Kolkata. Institute of Engineering and Management is one of the best colleges in West Bengal. Its admission is done through the entrances of WBJEE and JEE mains. In WBJEEjee, one needs to have a minimum rank of 5000 to get the chance to study here. However, this Rankings are tentative and are subject to change. To get in this college, you have to get atleast 60% marks in main subjects. In order to take admission in this college you have to give an exam named WBJEE (West Bengal Joint Entrance Exam) and you have to secure maximum 4,000 rank in this exam. I have secured 2,469 rank in WBJEE and I get CSE stream. One has to be 12th pass out.one has to get a rank under 5k to get admission there in any of the department under B.tech course. The admission procedure is - the student needs to sit for WBJEE or JEE MAIN to get admission in IEM b.tech degree. And they should have a decent rank also, around 3,000 in WBJEE and 40,000 in JE MAIN. The admission is done via WBJEE Exam. In this exam, a rank is obtained by a student. Based on this rank, he/she can appear in counseling to get any branch in any college. Typically nowadays a rank under 800 might ensure a seat in ECE branch in my college. One need to score a rank up to 4000 in WBJEE for IEM, however, if u haven't given WBJEE, don't worry there is a councilling done on jee main rank basis on the official site of wbjee, but your JEE Main rank should be under 45000. Good score in intermediate is the main eligibility criteria. Admissions are done by ranking and counseling process. Joint entrance exam for engineering WBJEE is considered for the admissions. my rank was under 5000 in WBJEE. Eligibility criteria for joining the Institute of Engineering and Management, [IEM] Kolkata is clearing the WB JEE. I got 1624 rank in the exam. I got 86.2 % in 12th CBSE board. You have to get more than 60 percent in your 12th exam. Then You have to sit on Entrance exams like WBJEE and JEE Mains. You have to get at least 120 marks in Jee Mains so that you can get a chance to take admission in this college. To get your self-placed into IEM(institute of engineering and management) you have to go through WBJEE(West Bengal Joint Entrance Exam) an entrance exam conducted by WBUT(West Bengal University). One must crack WB JEE exam to get admission in Institute of Engineering and Management. Students must score above 70% in higher secondary. The eligibility criteria to get admission to IEM College Kolkata is PCM u should have at least 50% and you can take admission through via given exam of WBJEE or via JEE MAIN ranks. The candidate must clear the JEE MAIN/WBJEE exam and must have passed the 12th with minimum of 80% marks from a recognized institute. Minimum 70% cutoff mark is required. One has to give the WBJEE exam to get admission in this college and to have scored a rank up to 7500.generally cutoffs differ from time to time. Admission is through the WBJEE(west Bengal joint entrance exam)exam, the cutoff rank for my course(BTECH-CSE) is about AIR 2000 in WBJEE exam. The candidate must clear the WBJEE exam and must have passed the 12th from a recognized institute. The cutoff mark must be below 3500 - 6500. The legibility criteria for B.Tech is 12 pass with good scores and JEE MAIN examination with the good ranking. U get admission here through wb jee rank for ECE ur rank should be below 2800 in wb jee. JEE MAIN rank is also accepted here. I took admission in Institute of Engineering and Management, [IEM] Kolkata through JEE MAIN rank. To need to qualify in WBJEE then you are eligible for taking admission in the institute of engineering and management. It's an overall good college, but we learn much more discipline than technology. Which are the companies that come for placement at Institute of engineering and management? HCL, IBM, Cognizant, Oracle, Godrej, NIIT, Huawei are some of the companies that come to IEM Kolkata. What is the fee for B.Tech at Institute of engineering and management? The fee for B.Tech at IEM Kolkata is Rs.3,24,000. What's the fee structure for M.Tech in Institute of Engineering and Management, [IEM] Kolkata	? BACHELOR OF ENGINEERING INR 81050 per year. What's the fee structure for BCA in Institute of Engineering and Management, [IEM] Kolkata?